“Every single day, someone somewhere makes a gigantic mistake by giving his or her money to a fraudster,” says Bart Chilton, one of the commissioners of the Commodity Futures Trading Commission (CFTC). Chilton is the author of Ponzimonium: How Scam Artists are Ripping Off America, a shocking new book available from GPO about some of the worst perpetrators of investment fraud in recent U.S. history. Figure 1: Ponzimonium: How Scam Artists Are Ripping Off America available from GPO. Ponzimonium looks to the CFTC’s own recent public case files stemming from fraud investigations that began with the recent economic downturn- talk about hitting people when they’re down! Because of the this, the book is generating a lot of positive buzz in The New York Times, TheStreet, and other media outlets. The CFTC is an independent Federal agency with the mandate to regulate commodity futures and options markets in the United States. After the financial crisis of 2008, their authority was expanded under the 2010 Dodd-Frank Wall Street Reform and Consumer Protection Act to include over-the-counter derivatives markets and hopefully prevent and uncover more of these frauds. What is a Ponzi scheme, you ask? Unlike pure pyramid schemes in which it is mandatory that a new investor recruit others into the deal in order to receive payments, Ponzi schemes purport to offer investors a “too good to be true” deal by simply handing over their money. However, no real investment is made by the criminal. 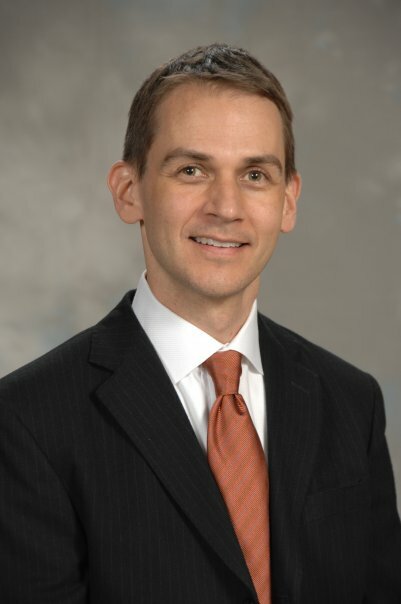 Instead, Ponzi schemes, named after 1920’s postage stamp speculator-fraudster Charles Ponzi, are scams in which early “investors’—often friends, colleagues, and family members—are asked to invest in a this great “no risk” deal offering unbelievable returns. Typically, the investor makes an initial investment and then some purported “phantom profits” are paid out by the con artist (really just money from other investors), prompting that investor to assume that his or her money has increased in value—and inspiring the investor to turn over more money to invest and tell others about it. In actuality, the perpetrators pocket the money for themselves. Figure 2. 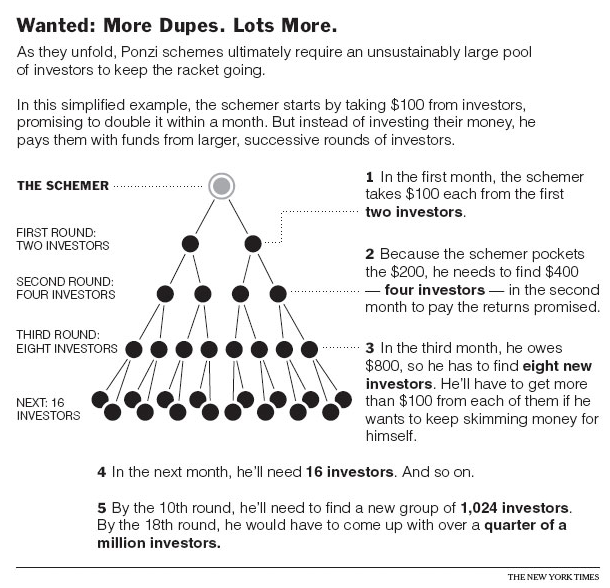 Ponzi scheme infographic. Image source: The New York Times 12/21/2008 Week in Review. Ponzimonium introduces some of the lesser known, but equally despicable fraudsters that have been uncovered since 2008 by the CFTC and SEC (Securities and Exchange Commission). The book lays out the fascinating and dramatic details behind the fraudulent schemes, their smooth-talking masterminds, and their many honest, hard-working victims, who often lose the money they’ve saved for their kids’ college funds, needed health care expenses, or their own retirement as a result of misplaced trust in these criminals. These stories are so engrossing— at times it felt like I was taking in a marathon of America’s Most Wanted or I Almost Got Away with It episodes— I found it hard to decide which of these criminals is the most despicable. Was it Beau Diamond of Diamond Ventures who wiped out his parents’ savings along with 200 other clients who invested US$37 million? 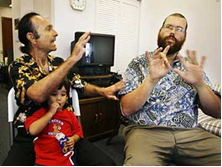 Or how about Marvin R. Cooper of Billion Coupons, who created a combination Ponzi and pyramid scheme called an affinity fraud, to t arget and recruit fellow deaf community members in the U.S. and Japan? And there’s James Ossie of CRE Capital Corporation (CRE) who bilked investors out of US$25 million, including a desperate father’s US$200,000 he invested to fund his young daughter’s cancer treatments. The human side behind these frauds makes them all the more compelling… and contemptible. The best way to avoid getting swindled, advises Chilton, is to “remember what your parents told you when you were little: ‘Don’t take candy from strangers’”, and my personal favorite, “Just because it is on the TV, Internet, etc. doesn’t mean it’s real!” That’s advice you can take to the bank. Ponzimonium: How Scam Artists are Ripping Off America includes some very useful features for its readers that make this a valuable resource for any investor. Red Flags of Fraud: Includes 20 red flags to look out for when considering an investment. Investor Checklist: Detailed list of questions to ask before investing. Investors’ Bill of Rights: Common sense advice and legal rights for any investor. Resources: Useful contact information for victims or witnesses of a fraud. Glossary of Fraud Terms: Definitions of legal and financial terms within each story. The Loot: Color photos of the criminals’ misbegotten gains and lavish lifestyle. The Numbers: Calculations of the staggering amounts collected, paid, lost, or stolen, and prison sentences and restitution. How can you get this Ponzimonium eBook? Get it online 24/7 at GPO’s Online Bookstore. About the Author: Michele Bartram is Promotions Manager for GPO’s Publication and Information Sales Division and is responsible for online and offline marketing of the US Government Online Bookstore (Bookstore.gpo.gov) and promoting Federal government content to the public. She has been researching identity theft and privacy issues for years, both on the web and in the real world, and is a big fan of more fraud protection for citizens.